I've never worn a peek a boo dress but this right here. I've noticed them a lot lately even on chicks like me who aren't well endowed in the bosom area (major sad face). Oh yes, this right here makes me want to ditch the mom part of my title and be a full fledged diva (i.e, Tracee Ellis Ross aka Joan) and hang out with my girlfriends all day in a ritzy part of town with boutiques, pastry shops, shoe stores and restaurants that become hot night spots after dark. I am really serving it up right now, :)!! 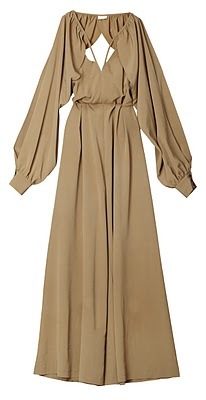 and this maxi dress too. Soft, flirty, blue (one of my favorite colors) and adaptable for a cardie and my cowboy boots for a cool day here in Florida. I can see it being remixed in a similar way to this look in my Maxi Skirt Remixed post. I already have this print in a maxi dress from the Spring 2010 Garden Collection and I haven't worn it yet. I'm sooo excited to be moving towards sleveless dresses and sandals...soon really soon! 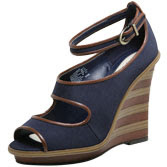 Which brings me to this Loreto wedge by Lela Rose. What are your shopping wants for spring? What store? Whose collection?